“Monster from the Ocean Floor” opens with Julie (Anne Kimball) sitting on a beach in Mexico and sketching the seascape. She decides to go for a swim, only to run into a one man submarine, piloted by hunky marine biologist, Steve (Stuart Wade). Later, while she is alone, she sees a gigantic one-eyed monster (heh, heh) rise out of the water. Of course being a woman and living in the 50’s, everyone thinks she is hysterical and indeed she is, passing out at the sight of a terrifying cow at one point, but that doesn’t make her any less right about the giant thing in the ocean. The only people who do believe her are some locals, which is too bad for Julie because they’d like to kill her as a sacrifice to the thing. Somehow atomic radiation is involved, because you know… 1950’s. Even with a run time of 66 minutes, it feels a little slow. I also wonder if they were stretching even that minimal run time because several scenes of dialog appear slowed down, resulting in everyone talking with a deep voice. This might have just been a transfer issue. There is some underwater photography, most of it murky and includes a far too long sequence of Julie annoying a real shark with a rubber knife. The film proudly announces the fact that there is a custom built submarine in the film. Although the final result is kind of neat, it doesn’t come across as terribly practical. Divers seem to keep up with it easily, and it feels like you’d lose a lot of field of vision in the thing. Using it as a final weapon against the monster just comes across as silly. The sub plot of the locals worshipping the monster, and planning on using Julie as a sacrifice is an interesting one. Or at least it could have been, it’s largely used to stretch out the thin plot rather than create any real tension. Letting the air out of someone’s tank before they go in the water just annoys a diver instead of causing any real peril. The whole thing gets resolved a bit too early, having Steve and Julie be forced to deal with the monster and cultists at the same time would have been a much more interesting climax. 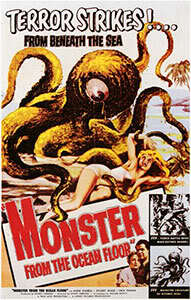 I didn’t expect a whole lot from this atomic monster film, but I still had a decent time watching it. If you have a particular affinity for 50’s b-movies I think you’ll enjoy it, otherwise there are better underwater monster movies from the same era that much more worth your time.